Read from June 26 to July 07, 2015. After two recommendations, despite my hesitations, I decided that I would give this novel a go. I admittedly judged this book by its cover. I thought that this book was just one of those sappy feel good novels that a middle-aged married woman would buy and read at her book clubs. While the ending has a happy moment, it isn’t completely uplifting, it is however satisfying. The majority of the novel is full of the tribulations of Harold and his wife Maureen making the plot and characters very intricate. Harold, a recent retiree, receives a letter from an old co-worker, Queenie, that he hasn’t seen in over 20 years. The letter states that Queenie is dying of cancer. Harold, while out to deliver his reply to Queenie becomes inspired by an interaction he has with a young girl and decides to walk to the 600 miles across the country to see Queenie. Convinced that his pilgrimage will save Queenie, Harold leaves on his journey immediately. He doesn’t have proper shoes, a cell phone or a map with him. He phones his wife, Maureen from a pay phone to inform her of his intentions. Maureen, is startled by his sudden choice to partake in this insane journey. Harold and Maureen’s life together has been far from ideal over the last few years and through this very random journey both Harold and Maureen start to analyze their average lives. Harold regrets not being a better father to their son David and wishes that he hadn’t lived his life so carefully, while Maureen starts to realize that she could have been a better wife to Harold in the last few recent years. The two of them, though separate through Harold’s walk, take a journey of self-awareness, love and forgiveness. What makes this book difficult to put down is just how human both Harold and Maureen are. They have both made such real and human mistakes. At first, you’re taken back the inability for this couple to communicate and how cold they can both be but as your learn more about each of their pasts and how they chose to handle certain situations you realize how each of them came to be as they are. You don’t get the full story behind all of the characters until very end. The author, brilliantly, leaves a trail of breadcrumbs in terms of the character’s past that all comes together near the conclusion of the book. 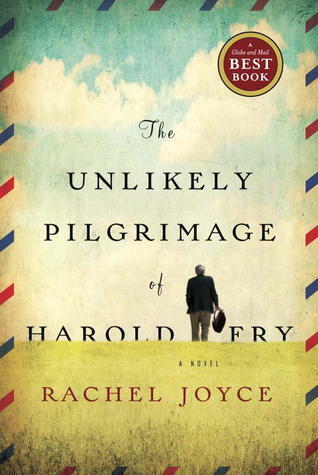 This story is extremely heartwarming and I found Harold’s journey extremely enjoyable. I definitely found myself getting a little teary eyed near the end. I would recommend this book for those over the age of 25 as I don’t think a younger crowd would enjoy or connect with some of the turmoils that Harold and Maureen go through. Anyone in a committed relationship would also take enjoyment out of this novel. Previous Previous post: Boourns, no post today.